Ticketing companies, venues, and event organizers can use the fastest barcode scanning app to instantly validate online or offline and also stop the use of duplicate IDs – with or without a database. The codeREADr mobile app is used by over 100 of ticketing companies globally for event access control. Why? If your ticketing company (or ticketing software) has integrated with codeREADr, you’re all set – they’ve taken care of everything for you. But what if they haven’t? Can you use our app? Yes, you can! If you can download a CSV file of your ticket IDs then you can import them manually to codeREADr. It only takes 1-2 minutes, even with large databases (up to 1 million rows). But what if the ticket IDs are not available, either because you don’t have access or because tickets are sold up to and after the event starts? Can you still use the codeREADr app? Yes! If you don’t have access to your ticket IDs but your ticket IDs have a consistent pattern, the app can validate against that pattern. It’s not as secure as validating the entire ticket ID but it’s a potentially viable option, especially if the biggest concern is catching the duplicate use of the same ticket. What if there is no Pattern for the Ticket ID? If your ticket IDs have no pattern, you can still use this feature for stopping the use of duplicate tickets. Can Pattern Validation also be used with a Partial Database? Yes. This is common when ticket sales continue through the start of the event. The latest database available before the event starts is uploaded to the codeREADr servers and scans are first validated against that database. 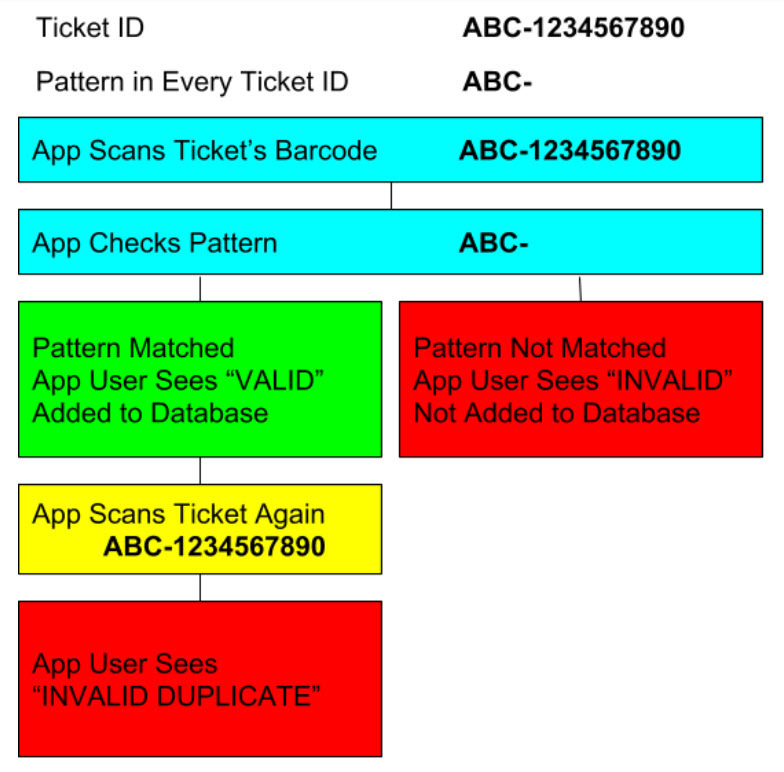 Pattern validation automatically is used for the tickets sold after the upload. Generally, the ‘Response’ text or HTML entered in the pattern validation’s form field should indicate to the app-user that the ticket ID was issued at the event – or similar text so they may look a bit closer at the ticket. Are Database Validated and Pattern Validated Scans Synced to All Devices? Yes, provided there’s at least some Internet connectivity when scanning.